This shoe style has been everywhere. As a mother always chasing after two small children, I’m thrilled that I can sport a fashionable and functional trend which says “casual cool” — but not be tripping over myself or the double stroller. 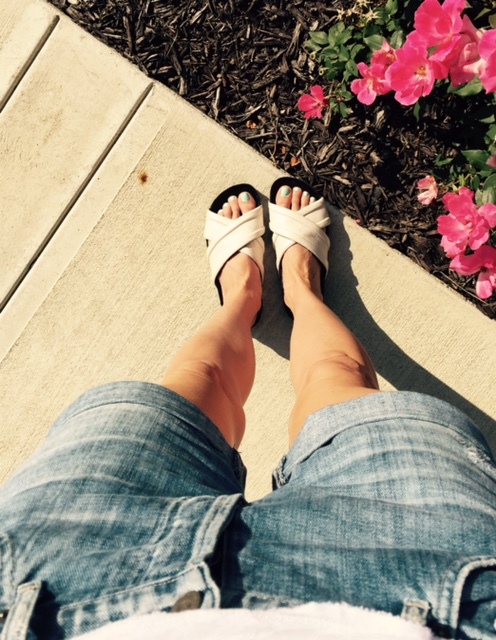 These sandals are more formal than the traditional flip flop, come in bulkier styles that provide a little masculinity — which I LOVE — and are available in every print and texture imaginable (think leather, metallic, florals). Even better, they are a little unexpected when paired with something super feminine like a white linen dress. Perfection! I invested in a Vince pair with white leather crisscross straps and a fun, but sophisticated calf hair pair from the French designer label IRO. I’ve been wearing both with everything from cut offs and skinny jeans to a shirt dress and maxis. Thanks so much for commenting on the blog. Appreciate you taking a moment to read the posts. More to come soon! more. Thank you for wonderful information. I was searching for this information. Glad to hear! Thanks. Several posts will go up a week so I encourage you to follow along and recommend any topics you’d like to see highlighted in this space! Thank you so much for the positive feedback. I appreciate you commenting on the blog and hope you continue to check out future posts. I’ll share several times weekly and am open to suggestions if you have questions or topics you’d like to see covered in the future! Take care and have a great weekend. you hire someone to do it for you? Plz answer back as I’m looking to construct my own blog and would like to know where u got this from. Thanks so much! This is an affordable template offered through wordpress.com. Several other free ones are available. I also did a premium membership so I could have access to customize colors and themes. Let me know if you need additional info. Take care. Wonderful! Glad you are enjoying the blog. I’ll post often so please stay tuned and let me know if there are specific topics you’d like to see covered! nevertheless I wish to say that this write-up is amazing! Thanks so much for the comment. Glad to hear you’re enjoyed the post. I’ll share several posts weekly so please check back often! Have a great holiday weekend. So glad to hear! Let me know if there are other topics you’d like highlighted. Happy Friday. you. You saved me lots of frustration. Amazing post! Glad you enjoyed the post. Thanks and have a great weekend. I’ll look into the issue and report back. Glad you enjoyed the post.